Above all else, prayer leads Orthodox Christians to repentance, forgiveness, piety, and every virtue inspired by Great Lent. His Eminence Metropolitan Joseph preached this lesson at St. Nicholas Antiochian Orthodox Christian Cathedral in Los Angeles on the Sunday of the Publican and the Pharisee, the day that ushers in the Church's preparation for the Great Fast. Sayidna Joseph said that the Pharisee, a religious leader perceived to be pious, offered a "judgmental prayer" to God by saying he was not like others, "extortionists, unjust, adulterers, or even like this tax collector" (Luke 18:11). "This is not a prayer at all," His Eminence said. "But the Publican offers a holy prayer — 'God, be merciful to me a sinner!' (Luke 18:13) — this is what God wants to hear from us.He is ready to visit us through this type of prayer because we are ready for Him." His Eminence likened the Pharisee's prayer to superstition, thinking he could justify his faith by tithing and fasting twice a week (Luke 18:12). "This is just like thinking it's enough to light candles, socialize, and then fight one another in the Church," Sayidna said. He pointed the faithful to the prayerful humility of the Publican. "When we humble ourselves, we lose nothing but pride and anger and gain Christ. He moves closer to us and we move closer to Him." 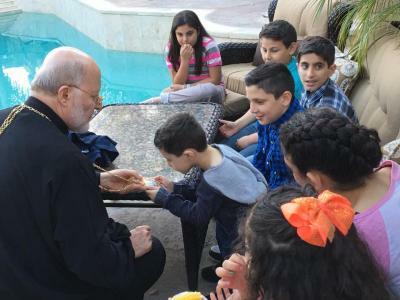 After the Hierarchal Divine Liturgy and the fellowship hour next door in the Cathedral Hall, Sayidna Joseph traveled to the home of Ehab and Rania Dahabreh, where he blessed the house and shared his vision and updates for The Antiochian Orthodox Institute (TAOI). He and TAOI's director, V. Rev. Fr. 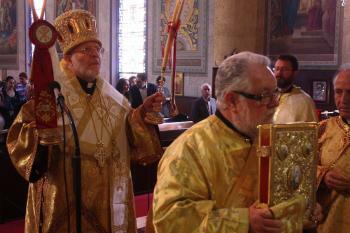 Michel Najim, conveyed how it will further equip present and future shepherds to more fully minister to their flocks beyond their initial seminary and theological formation by giving them residency and training in the ethos, practices, and outreach techniques of the Orthodox Church and its saints of the Holy Tradition. Sayidna Joseph and Fr. Michel, along with other leaders and board members of TAOI, fielded questions from the donors on the importance of the Institute's work and how to get involved. In its first year, it has received more than $100,000 in donations to be used, in part, to renovate the facility purchased in LaVerne, Calif. TAOI has scheduled a seminar on the formation of the Holy Bible in the Arabic language through ancient origins and modern application in the lives of believers. St. John Coptic Orthodox Church (21329 E. Cienega Ave., Covina, CA 91724) will host the seminar on Sunday, May 22, 2016, from 5–8 p.m. For more information about the seminar, you can email biblecelebration2016@gmail.com. To learn more about The Antiochian Orthodox Institute, which offers the only English-language Orthodox Christian Ph.D. program in North America, visit their website and Facebook page.